Enjoy a quick and easy Chicken Salsa Pie with a cornbread crust. The recipe combines flavors of the deep South and Mexico for a hearty meal that can be mild or spicy to taste. We doctor up cornbread in the South to come up with all kinds of interesting flavor treats, and one of my favorites is Chicken Salsa Pie. 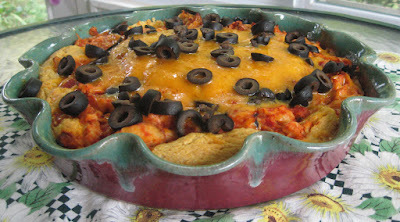 It has a basic cornbread base but then gets some extra zip with chicken, cheese, and salsa. I love hot foods, so I make Chicken Salsa Pie with hot salsa pretty often, but one of my boys prefers milder foods, so I can tone it down by buying a milder salsa. In either case, this recipe hits the spot. In a medium bowl, combine the cornmeal, flour, and baking powder and stir well. You can alternatively sift these items if you own a sifter. In a small bowl, combine the water and egg and beat lightly and then add 1 cup of cheddar cheese (saving the rest of the cheese). Combine the dry and wet ingredients. Stir until mixed but don't over-mix. Grease a 9 inch pie pan and pour ¾ of the cornbread mixture into the pan. Combine the chicken, salsa, and ½ cup of the cheddar cheese (saving the last ½ cup for the top). Pour the chicken mixture into the pie plate on top of the cornbread mixture but leave 1 to 1.5 inches around the edge so the cornbread rises up and makes a side crust. Put the remaining ¼ cornbread mixture on top in the center and gently spread around until you have a neat circle with a gap where the chicken mixture shows. The top of the pie will look kind of like a doughnut but with a ring of cornbread at the sides, then a ring of chicken showing, and then the center ring of cornbread on top. Bake for 35 to 40 minutes at 350 degrees F or until the cornbread is nicely browned. Top with last ½ cup cheese and the olives sprinkled around on top and put back in oven for 5 minutes or until the cheese is melted. This dish is great served with a salad or cut fresh vegetables. Leftovers freeze well and can be warmed up in the microwave for a hot lunch at work or for dinner.